New independent fuel tests by Which? show that Vauxhall’s new Ampera ‘range extender’ electric car is very efficient in urban use – but not so good on longer runs. If the Ampera is used for short-distance journeys, such as commuting, shopping and school runs, it could be very cheap to fuel. Vauxhall’s new Ampera electric car has averaged the equivalent of 158mpg in the urban fuel test cycle in independent testing by Which? That’s impressive, but still far off the official EC urban fuel claim of 313.9mpg. The Ampera works like a regular electric car in that it can be recharged using a domestic electricity supply – a process that takes 4.5 hours – and can then travel up to 46 miles on this charge. At the end of this, its on-board petrol engine starts up to retain charge in the batteries. How much electric power or fuel the Ampera uses depends very much on how the car is driven. Essentially it could work well if you use the car predominantly for short journeys, but Which? tests show that a conventional diesel will cost less to fuel in everyday use. The cost of fully recharging the Ampera is around £1.77 at domestic rates, and a full charge of electricity will take you around 46 miles if the car is driven gently. That cost is about 25% that of fuelling a similar-sized Vauxhall Insignia diesel to do the same 46-mile journey, and equates to 158mpg. We also tested the Ampera over the first 62 miles of a combined fuel cycle, starting with full battery power, so that it used both electric and petrol power. For the first 46 miles, the Ampera used 12.2kWh of electric power, while for the following 16 miles it used 1.4 litres (0.3 gallons) of unleaded fuel. A conventional car would have to average 103.8mpg to match this. However, when driving with the battery depleted and the petrol engine running much more, fuel consumption rises dramatically. In this scenario, we measured the equivalent of 70.6mpg in urban use, 51.4mpg extra-urban and 43.5mpg motorway in our tests. The overall tested average is 51.4mpg – worse than many diesel-engined large cars, and way off the official EC figure of 235.4mpg. For short distances, and in electric-only mode, the Ampera emits zero CO2 from its tailpipe. Official EC tests give the Ampera a remarkably low overall CO2 emissions figure of 27g/km. However, according to Which? tests with the car in combined electric/petrol mode (driving 62 miles starting with a full battery), the Ampera actually emits 95g/km of CO2, based on CO2 emitted by electricity generation in the national grid, as well as the car’s own exhaust gases. This figure will be even higher when the car is used regularly for longer distances, when the petrol engine is used more. 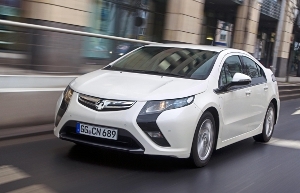 Vauxhall’s Ampera is on sale now, priced from £29,999 including the government’s £5,000 electric car discount, with deliveries beginning in May 2012. We test fuel economy under strict laboratory conditions, using realistic test cycles to reveal the facts behind the figures. Unlike the official EC mpg test, we measure economy with both a hot and a cold engine – and include a motorway test cycle. And, when testing electric or part-electric cars like this, we also factor in the CO2 output of the national grid (not just the tailpipe emissions). That’s why our mpg and CO2 results often differ from the figures you see in glossy car ads.